Here's one that predates even me, old fart that I am. "Three Days Of The Condor" is a 1975 film from Sydney Pollack starring Robert Redford, Faye Dunaway, Cliff Robertson and Max Von Sydow. It's in that genre I find hard to get enough of - paranoid spy thrillers. I've learned over the years that I like Robert Redford in about anything, and when I found out he was in a spy film from just before I was born, well, needless to say I was intrigued. Add in the fact that it was a Sydney Pollack film (he's best known for directing "Tootsie" but he was a fantastic director and a great actor to boot) and you had my attention. Redford plays Joe Turner, a CIA researcher out of New York, code named Condor. He's, well, he's a reader. It's his job to read magazines, novels, newspapers, etc., and to be on the lookout for clandestine messages hidden within. For example, he's reporting to the CIA about a novel he's reading, that isn't very good, but has been translated into a surprising number of languages, which is, in itself, somewhat unusual. He's not a field agent. He makes this very clear a number of times in the film. But he is very smart. One day, he goes out to lunch and comes back to find his entire office murdered, and himself on the run. And he suspects the CIA may be trying to set him up. So he enlists the help of a woman entirely at random. Part of what's so great about this film is the feeling that no one, and I do mean no one, is entirely trustworthy. The film wasn't long after Watergate, and while they were filming it, another bunch of scandals had come to light, pointing the finger clearly at the CIA. Pollack said a number of times that it just happened to be an interesting coincidence, as they were basically in post production when the scandal broke, and they simply got lucky. The cast is excellent and Pollack gets mileage out of them. Redford is rarely less than great, and he's got a real sense of tension in this movie. I'd seen Dunaway in "Network" but it had been a while, and I was glad to see that "Network" wasn't a one-off and she portrayed a genuine sense of terror. And if you want a villain, well, Max Von Sydow practically wrote the book on that. He was Blofeld and Ming the Merciless. I mean, c'mon. 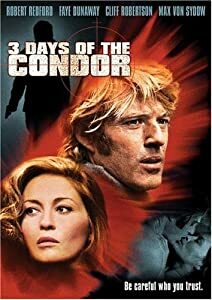 Redford would revisit the spy role a number of other times in his career, and I'm sure we'll get to some of those films at some point in the blog, but for now, I leave you with the trailer for "Three Days Of The Condor."